Art et Liberté: Rupture, Guerre et Surrealism en Égypte (1938 – 1948) is the first comprehensive museum exhibition of its kind about the Art and Liberty Group (Art et Liberté-jama’at al-fann w’ al-hurriyyah), a collective of surrealist writers and artists living and working in Cairo. Founded on December 22, 1938 upon the publication of their manifesto Long Live Degenerate Art, the group provided a restless generation of young artists, writers, intellectuals and political activists, with a heterogeneous platform for cultural and political reform. 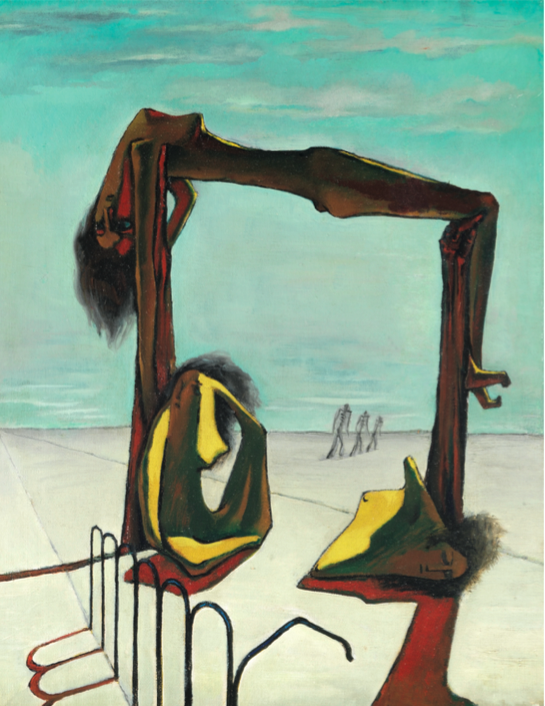 The exhibition highlights the active role that Art et Liberté played within a complex international and fluid network of surrealists, spanning cities such as Paris, London, Mexico City, New York, Beirut and Tokyo. At the dawn of the Second World War and during Egypt’s colonial rule by the British Empire, Art et Liberté was globally engaged in its defiance of Fascism, Nationalism and Colonialism. The exhibition is organized around a number of sections that reflect the thematic concerns and artistic practices of the group. One section, for instance, explores Art et Liberté’s treatment of the human body, responding to the destruction, poverty and prostitution brought by the war. Another, highlights the idea of “Subjective Realism”, the group’s definition of Surrealism that frames it’s differentiated pictorial and literary expression. One section is devoted to photography, illustrating the group’s adoption of techniques dear to the Surrealists such as photomontage and solarisation, and the use of the surrealist photograph to critique nationalism, notably here through the irreverent representation of Ancient Egyptian monuments. To give one more example, one section explores the connections between literature and visual art within the group, and pays tribute to one of its founding figures, the Surrealist writer Georges Henein, who was very close to André Breton until they parted ways in 1948. In addition, the exhibition provides an excursion into the Contemporary Art Group, a collective of artists whose members – some of whom were affiliated with Art et Liberté – are among the most recognized of Egypt’s modern artists. This section reveals, for the first time, that unlike what is commonly known, Art et Liberté did not see this collective as a continuation of their Surrealist practice, but as a mouthpiece for a new form of nationalism. Previous postTATE LIVERPOOL | Art & Liberty, Raupture, war & Surealism in Egypt ( 1938-1948) | | fourth Presentation in Eurpoe... Next postInvitation to Private Preview - Reina Sofia, Madrid - February 14, 2017 - "Art et Liberté: Rupture, War, and Surrealism in Egypt (1938 - 1948)"